Containment Protocols: Currently there is no reliable method of containment for RPC-351. Assigned personnel are to keep RPC-351 under continuous surveillance. Wherever RPC-351 appears, if possible, Procedure 432-Jakarta is to be carried out in full on the surrounding area. Any armed personnel tasked with carrying out Procedure 432-Jakarta is to carry their ritual daggers and other essential materials on their persons at all times and are to be cycled out after the execution of said procedure for psychological treatment, with possible administration of Class C amnestics if deemed necessary by psychological review. Said personnel are also to be checked by medical staff regularly for bloodborne pathogens possibly gained from execution of Procedure 432-Jakarta. Research must be conducted immediately in order to ascertain a more reliable method of tracking RPC-351’s movements. Under no circumstances are any personnel of Hindi faith or personnel with vulnerabilities to low-level cognitohazards to be assigned to efforts to contain RPC-351. 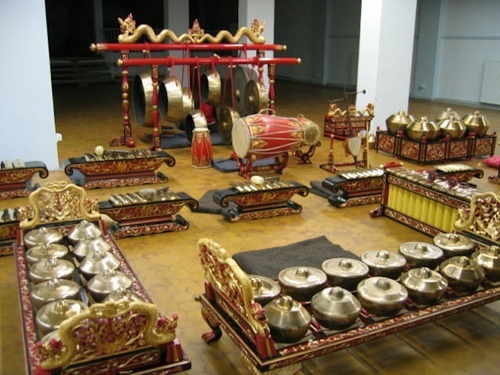 Description: RPC-351 is a traditional Balinese gamelan set consisting of twenty-five (25) various percussive instruments. In particular, the set consists of six (6) bonang kettle sets, a set of sixteen (16) metallophones consisting of one (1) gendèr, twelve (12) sarons and three (3) slenthem, two (2) kendang drums, one (1) Kethuk, and a setup with five (5) gongs. All instruments are decorated with red satin and ornate wooden carvings of dragons.1 The metal the instruments are made from is unknown, not appearing on the periodic table of elements, and the mallets used to play the instruments of RPC-351 are made of a hard substance resembling human tooth enamel. The set has shown no wear or tear across the Authority’s ██-year history with RPC-351. RPC-351’s anomalous properties are highly varied: it does not stay in one singular place indefinitely. Rather, it will seemingly disappear and reappear in different places at different times. RPC-351 cannot be moved or damaged when in one of these spots. Upon RPC-351’s appearance in an area, anyone within a 50m radius that comes into visual contact with it will express a desire to play one of the varied instruments in its ensemble. If they manage to physically reach RPC-351 and begin playing said instrument in the ensemble, they will demonstrate mastery of it as they begin playing a musical piece that cannot be found in any worldwide musical records. The mastery of said instrument is regardless of prior knowledge or training with musical instruments in general. The range of this effect exponentially grows with each person that joins the ensemble, reaching a known radius of at least [DATA EXPUNGED]. Once a person starts playing an instrument of RPC-351’s ensemble, it will be impossible to break their concentration in playing the piece, regardless of any methods used except Procedure 432-Jakarta. Said individuals will no longer speak to anyone and will only focus on playing. Brain function does not cease during this period, but the individual will be basically reduced to an automaton whose sole purpose is to play the instrument in front of them. Said individuals will be referred to as RPC-351-1. After there are ██ instances of RPC-351-1, the dragon carvings on the instruments of RPC-351 will start oozing a liquid from their tongues that has the chemical composition of human saliva. At this point, RPC-351 will have developed auditory cognitohazards in addition to visual ones. Visual contact with RPC-351 is no longer necessary in order to turn individuals into instances of RPC-351-1. At a capacity of ██, RPC-351-1 instances will start to develop deep cuts on the inside of the palms of their hands that are prone to bleed heavily, possibly inflicted by the mallets used to play the instruments. This development does not hinder the performance of the piece whatsoever. Once RPC-351’s ensemble has reached full capacity, the combined playing of the entirety of the ensemble’s instruments will generate a harmonic signal that is unable to be reproduced by any Authority technology. This signal will grow in amplitude until precisely nine (9) minutes after reaching full capacity, at which point it is loud enough to shatter glass and cause deafness in anyone without hearing protection. Eighteen (18) minutes after reaching full capacity, the signal will be so loud that hearing protection will be rendered obsolete and individuals will be rendered deaf regardless. In addition, a tear in the fabric of space will start to form above RPC-351, through which can be seen [DATA EXPUNGED], hereby referred to as RPC-351-X. RPC-351-X will exit the rip in space nine (9) minutes later, at which point [DATA EXPUNGED], rendering anything within a 1500km radius lost with no survivors. RPC-351 will relocate shortly afterward. RPC-351 can be attributed to the estimated deaths of ██████ non-Authority persons, ██████ personnel and it is responsible for the drastic change in approximately ██████████ square kilometers of previously inhabited land. RPC-351’s only known pattern of travel is that it will almost certainly appear in a music venue or at a musical event, showing no preference for the number of people present or the number of people that could fit inside said venue. The only requirement appears to be that there be enough people to fully staff RPC-351. Discovery: RPC-351 was first discovered in the year ████ after it appeared at an underground jazz club located in what is now the Mojave desert. After its discovery, RPC-351 relocated to a location unknown to the Authority at the time, and thus temporarily fell in priority, until it was found again at a small café, formerly located in what is now known as the Rocky Mountains. It was not until its fifth appearance until Procedure 432-Jakarta was first successfully implemented, and research could begin. Procedure 432-Jakarta is to be carried out as soon as RPC-351’s presence is detected, in order to maintain control of the situation. All instances of RPC-351-1 are to be swiftly [DATA EXPUNGED] simultaneously by assigned agents. The blood gathered in agents’ pans is to be [DATA EXPUNGED] by said agents once reaching capacity. Once each agent has finished, RPC-351’s cognitohazardous properties should have ceased, and safe interaction with RPC-351 is possible until another relocation event. Despite this, the venue in which RPC-351 is located is to be temporarily shut down to the general public under the premise of a “gas leak” until RPC-351’s relocation. All non-Authority survivors are to be administered Class C amnestics immediately. In case of failure of Procedure 432-Jakarta, all non-Authority individuals with knowledge of or relationships with RPC-351-1 instances and all non-Authority individuals with even a cursory knowledge of the affected area are to be administered Class C amnestics. Authority personnel under the guise of environmentalists and conservationists are to convert the affected area into a research site operating under the cover of a wildlife reservation or national park. Note: The following is a record of all the appearances of RPC-351 known to the Authority. This includes all executions of Procedure 432-Jakarta, successful and unsuccessful. The audio cuts in as RPC-351 is heard being played, with the anomalous waveform causing damage to the recording. After five seconds, a loud impact is heard, assumed to be RPC-351-X exiting the tear and hitting the ground somewhere near RPC-351. All playing of RPC-351 immediately stops. RPC-351-1 instances begin speaking Hindi in unison. Poor audio quality muddles some of the statements. Indecipherable parts are blacked out. One of the RPC-351-1 instances, referred to as RPC-351-2, speaks English in a monotone voice. RPC-351-2: ███, who gr████ life. RPC-351-1 instances: Om kl███████ka-yei nam███. RPC-351-1 instances: ██ sri ma██ kal███yai ███aha. RPC-351's gong is heard being hit extremely loud, followed by a scraping sound of metal against metal, assumed to be coming from RPC-351-X's [DATA EXPUNGED]. RPC-351-X speaks in a loud voice that can be heard clearly through the static. RPC-351-X: Demons. I grant you death. A loud clanging sound is heard. Audio abruptly cuts to static afterward. Closing Statement: According to time estimates, at that moment, seismic activity achieving ██ magnitude on the Richter scale occurred within the area. No seismic activity was felt outside of the usual 1500km radius. WARNING: Access restricted. Minimum of Level 4 security clearance required. You have probably heard the reports from the researchers by now. The situation with RPC-351 is growing worse. As it turns out, its appearances seem to be dictated by audience size after all, and that number is exponentially growing with each relocation. The researchers were actually able to predict that it would show up in New York, though I doubt they could repeat that. Speaking of, I have read the report on the execution of Procedure 432-Jakarta. It is unacceptable how your team almost lost control of the situation. I do not care whether or not you all like the procedure. I do not care that it appeared in a crowded music hall with more audience members than citizens of some small countries. The fact of the matter is that we almost lost Times Square. You accepted this job understanding the consequences of failure. I have instructed the researchers to refocus on engineering a way to permanently contain RPC-351. In the meantime, get your men under control and get training. I am sending someone around to see whether or not your team will be in shape to execute 432-Jakarta in the near future. If he agrees with what I am thinking of you at the moment, your team will be reassigned effective immediately. RPC-351 has grown too bold. We cannot have another failure. You are an Authority Commander. Act like it. 1. These dragons have tongues that are abnormally long for typical depictions of dragons in such region. The tongues are painted blood red and the dragons themselves are painted gold with subtle blue highlights.